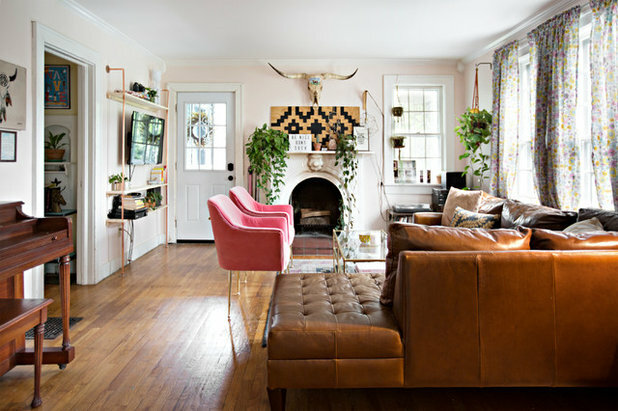 Functionality was the highest priority for Casey Freeman and Savannah McNeill when they renovated their 1945 East Nashville home. 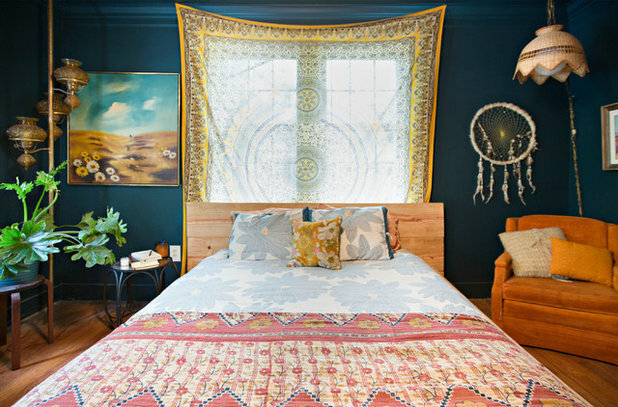 Freeman and McNeill — longtime friends and co-owners of the clothing label Hey Wanderer — wanted a place they could call home and use as their studio, a place that would stay true to their shared eclectic bohemian style. 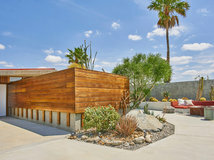 When they bought the home, there were wood-paneled walls upstairs, only two bedrooms and no central air conditioning. 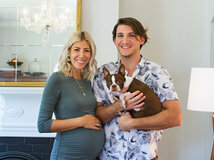 Freeman says, “It needed a lot of work, but my stepdad saw the potential.” With the help of Freeman’s stepfather, Richard Booth, they worked hard for 18 months to make the home just how they wanted it to be. “We added central air, two bedrooms and multiple closets, gutted the kitchen, painted the exterior and had professional landscaping done,” Freeman says. 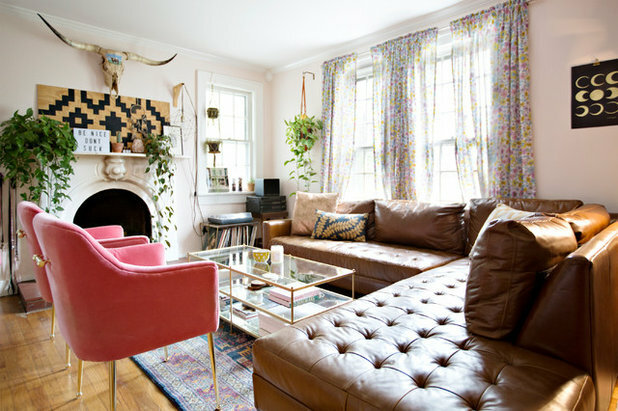 “Our style is bohemian, eclectic, maximalist and ever-changing. 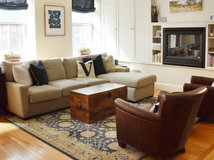 We’ve already redecorated the living room since moving in a year and a half ago,” Freeman says. McNeill frequently plays the piano in their living room. 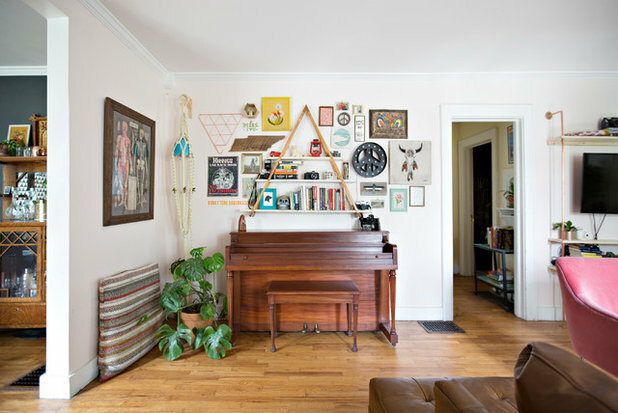 It’s situated against a gallery wall of various items the two women have collected over the past few years. Freeman and McNeill also needed a studio to house the clothing for their brand. 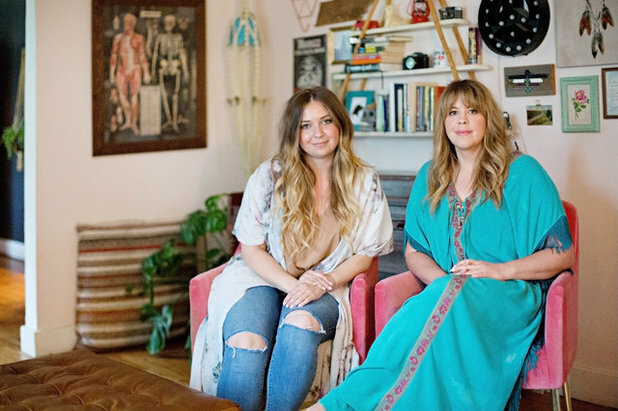 They make hand-dyed kimonos, caftans, blankets and jewelry and wanted one space where they could do all their work. 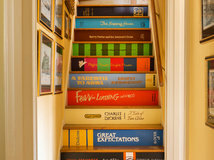 They decided to use what had been designated as a bedroom, which sits directly off the dining room at the end of the hall. Booth built the worktable and also helped transform the room into the space it is now. 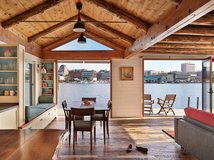 Freeman and McNeill added the closets, beams, French doors, wood wall and built-in desk. 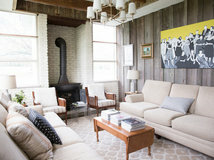 “We love the functionality of the studio and also the wood wall and the wood beams,” Freeman says. One of their favorite spots in the house is the breakfast nook in the kitchen. 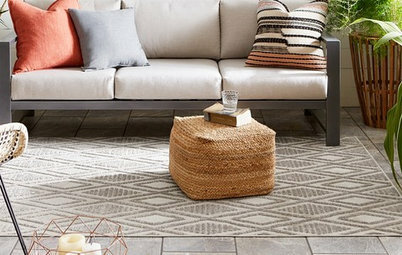 This light-filled space serves as a cozy spot to eat meals, have conversations over coffee and get work done. 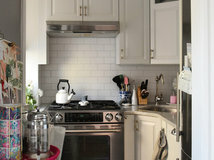 The kitchen was originally painted green and had yellow laminate countertops. Booth, “who did the majority of the renovations, gutted and renovated the entire kitchen,” Freeman says. The breakfast nook was added during the remodel. 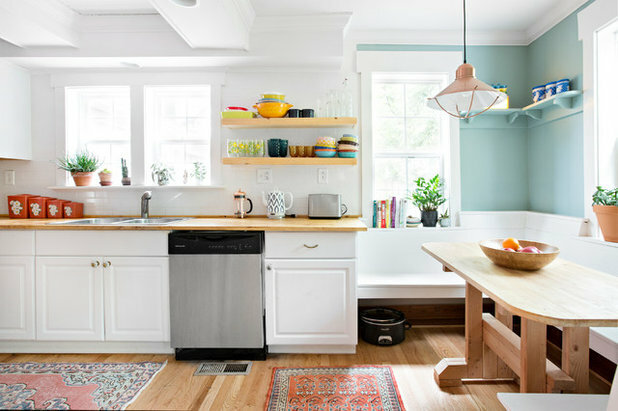 When it came time to decorate, the women put their signature bohemian touch on the kitchen. They added vintage kilim rugs from Apple & Oak, colorful dinnerware on the open shelves and various plants along all of the windowsills. 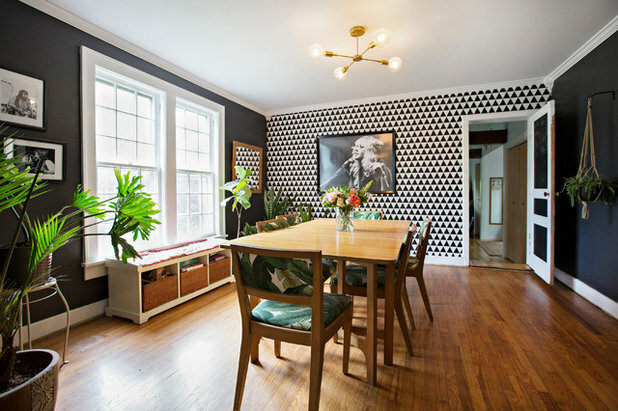 The dining room features an accent wall with patterned black-and-white Eijffinger wallpaper, and framed black-and-white photographs. The dining chairs are vintage and were re-covered in an iconic Tommy Bahama print. 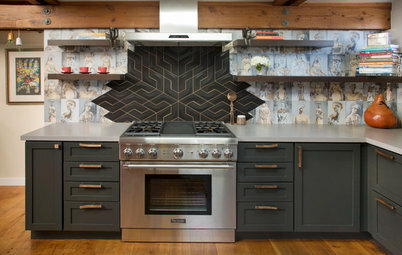 “The Stevie print in the dining room was inspired by a picture I saw of a giant print of Kurt Cobain on a black-and-white diagonal-striped wall,” Freeman says. The pair found the image online, printed it out and purchased a frame for it on Amazon. Wallpaper: Black & Light No. 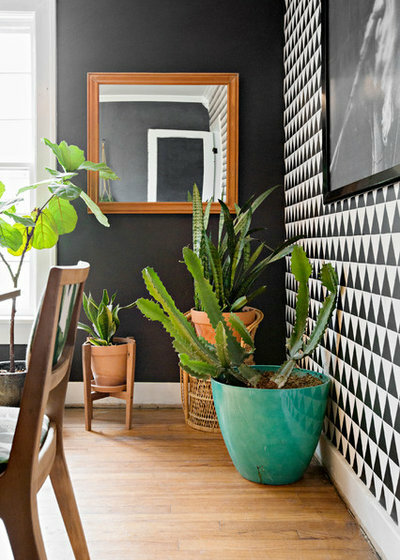 356011, Eijffinger; wall paint: Cracked Pepper, Behr; light fixture: Schoolhouse Electric & Supply Co.
Freeman and McNeill have a wide variety of potted cactuses, succulents and fiddleleaf figs throughout the house, such as these in the corner of the dining room. 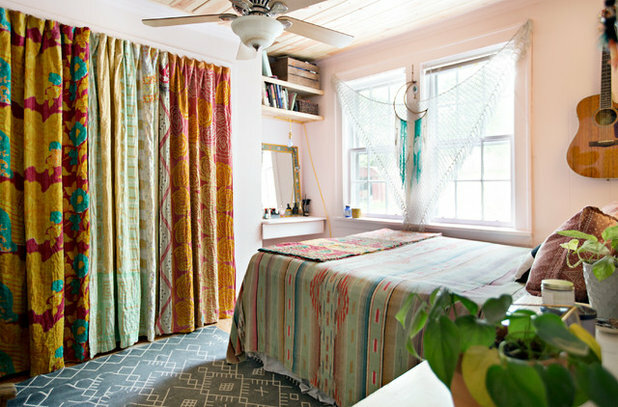 McNeill’s room is pattern heaven, between her Southwestern-style bedspread and the DIY curtains she hung to cover up her closet. 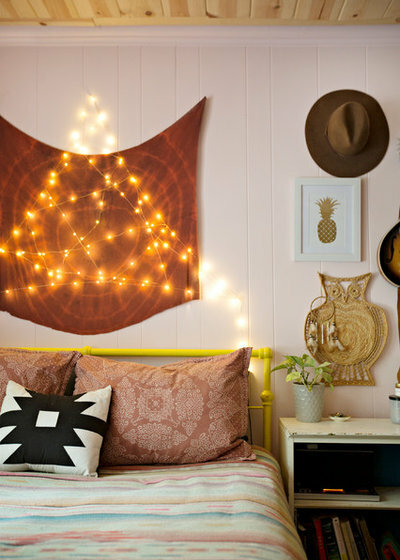 She used a calming pink paint to neutralize all of the prints. 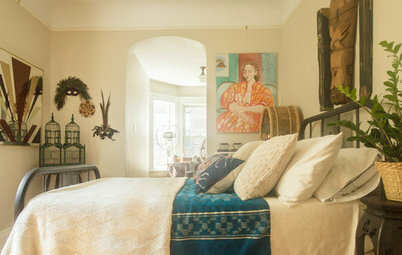 McNeill’s personal eclectic style can also be seen in the layered patterned bedding and pillows, and a gallery wall featuring some of her favorite items above her bedside table. Freeman went with a deeper, darker wall paint in her bedroom. 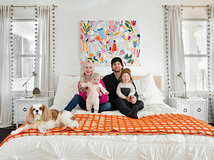 She and McNeill have equally eclectic senses of style and love to play around with color, texture and pattern to create unique and inviting spaces. The house has two guest bedrooms upstairs, which Freeman and McNeill rent out. 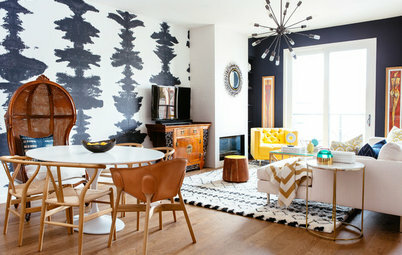 They wanted to carry the same bohemian vibe throughout the second floor so that guests could have the same experience. 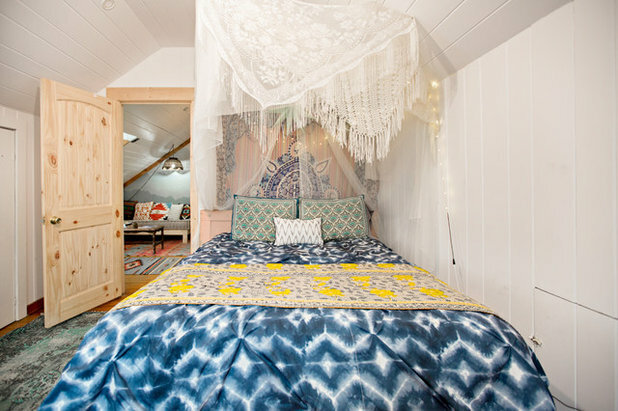 In this room they added a macramé curtain over the bed for a canopy-like feel. 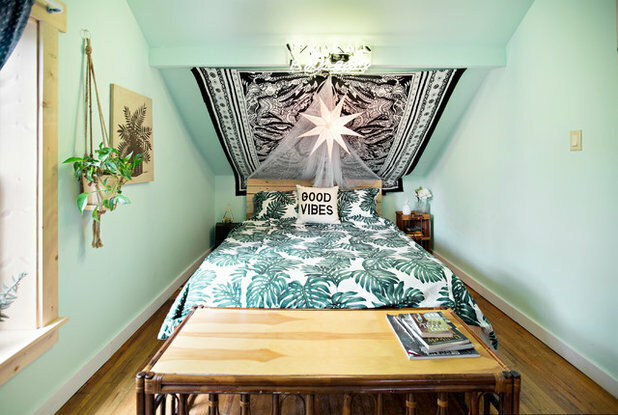 Palm prints show up in the other upstairs guest bedroom, where Freeman and McNeill designed the room around a classic palm duvet cover. 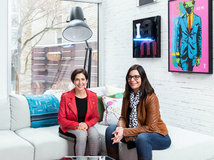 A neon light, called It Was All a Dream, tops off the space, making it fun but still cozy. 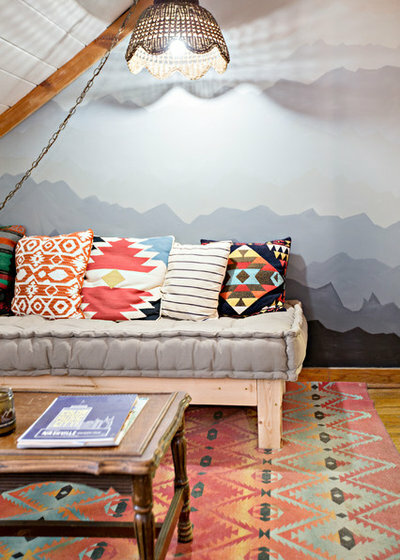 McNeill painted a dreamy mural in a room between the two upstairs bedrooms. 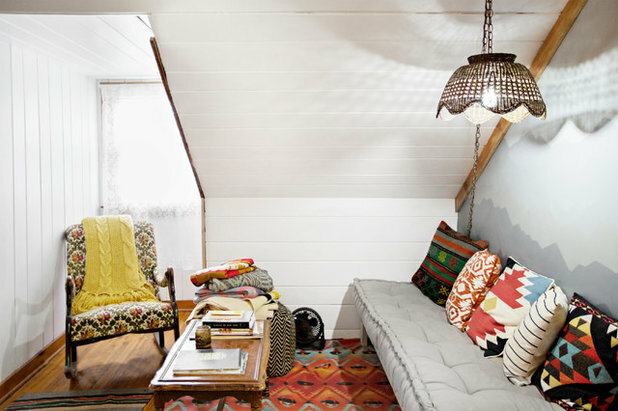 The space includes a comfortable daybed, a vintage rocking chair and some reading material to make a peaceful space for guests. The wood daybed frame was a DIY project. 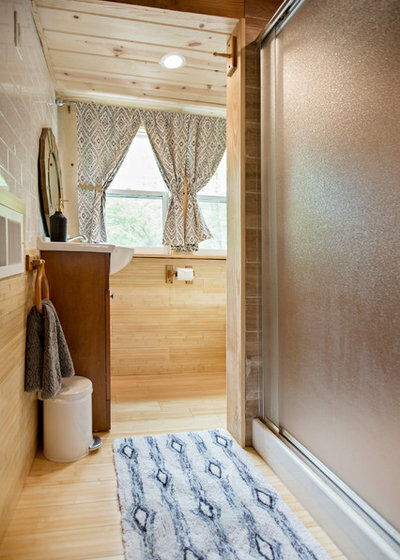 The upstairs bathroom has a quaint, cabin-like feel. It was gutted and completely renovated for rental guests to use. 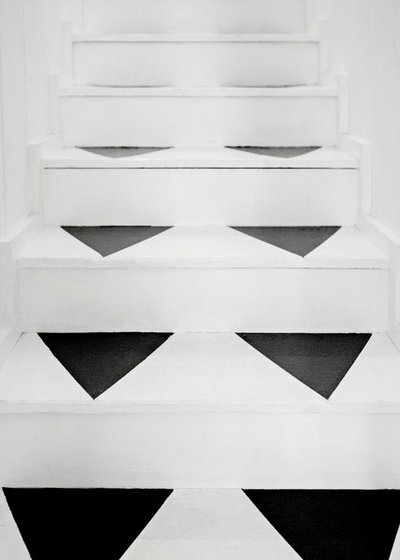 Each stair leading up to the second floor is painted with black triangles to tie in with the Eijffinger wallpaper in the dining room. Angie Downing, a Nashville craftswoman, was commissioned to help with this project as well as with painting the two upstairs bedrooms. 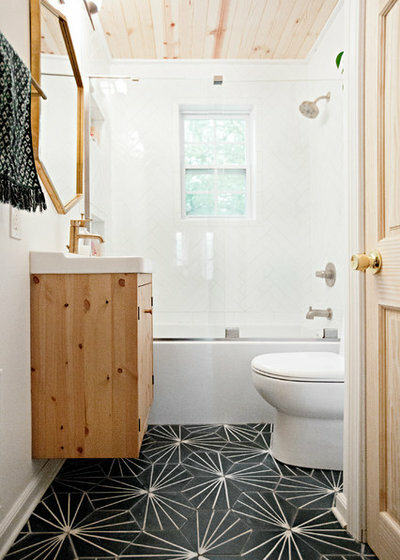 Freeman and McNeill transformed their shared downstairs bathroom with a full gut renovation. They replaced the fixtures, tile and vanity. 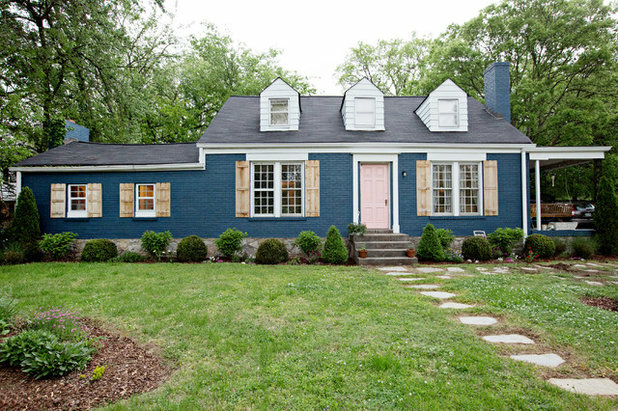 Freeman and McNeill painted the exterior a rich blue and gave the door a pale pink color to soften the look. 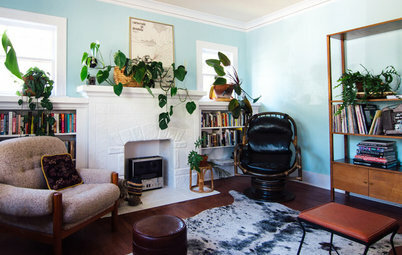 The home has become a really special place to both McNeill, pictured at left, and Freeman, right. 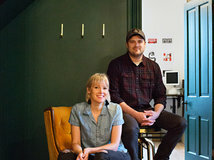 As longtime friends, they enjoy living together and running their business at home together as well. Both agree that “some days when I think about all of things that happen out of this house, I can’t believe we are lucky enough to live here,” Freeman says. Color, simple, multi-talented, classy young women. They will be successful no matter what they do in the future. Love their fashion sense - those kimonos are beyond just for weddings - spread your wings a bit more and you shall fly - hey, wanderer! What a feast for my eyes. Great idea for the diy closet drapes.